I meant to post this on Halloween, but we had a big storm and lost Internet access for most of the day. So happy post-Halloween! And here’s some Honey Caramel Corn for your to enjoy. This one’s from Golden Blossom Honey, so naturally the featured ingredient is honey. Since my favorite recipe calls for maple syrup, I figured I’d try this one and compare the two. This one has more butter and is quite a bit richer. I could definitely taste the honey, but it wasn’t overpowering. 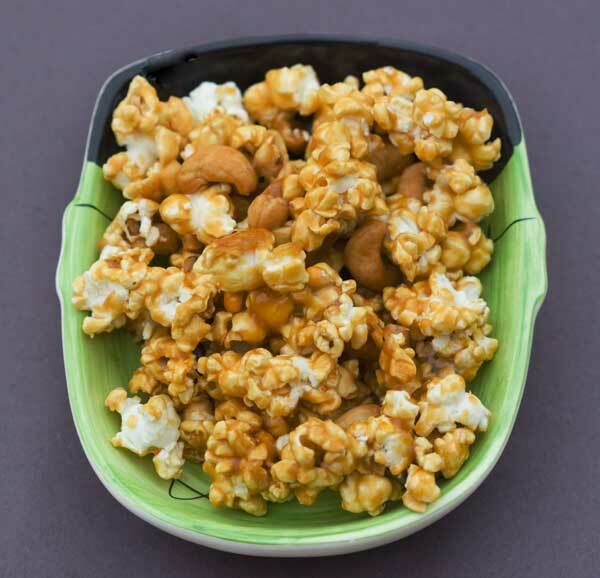 I’m not sure which one I like better, but if you or someone you know likes buttery and rich caramel corn, this recipe is probably a good pick. Caramel corn made with honey. Grease two large roasting pans or rimmed cookie sheets. I prefer using roasting pans. In a very large (4 quart) saucepan, melt the butter over medium heat. Add the brown sugar and next 3 ingredients, stirring constantly until mixture boils. Boil gently, uncovered and without stirring, for 5 minutes. Remove from burner and add baking soda and vanilla. Pour warm mixture over popcorn and toss until coated. If you are using two roasting pans, you can do this directly in the roasting pans. If using rimmed cookie sheets, you might want to divide the popcorn among a few large bowls or put it in a really big one to stir. Spread popcorn out in the pans and bake at 250° for one hour. Every 15 minutes stir the popcorn to keep it from burning. Let cool completely. Sarah, you can use whatever kind you want. I use plain popcorn which I microwave in a brown paper sack. Use whatever type of popcorn you feel comfortable making. Do you use microwave popcorn, or some other type for this? Sue, mine wasn’t as crispy as the maple syrup versions, but I think I took it off the heat a little too soon. It was still crispy, though. As for the honey, I don’t like honey enough to use it by itself, but I like how it adds subtle flavor to various dishes. I’d say that in this recipe, you can tell there’s honey, but there’s enough other flavor from the corn syrup and vanilla to balance it all out. I’ve never made caramel corn with honey. Does it turn out nice and crispy? I used to be a honey hater but I’m coming around and actually like it more and more.